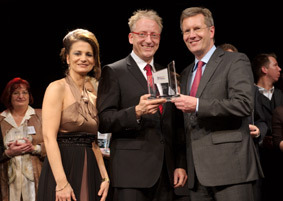 Andreas Contag, proprietor and director, was awarded the title “Mutmacher der Nation- Vanguard of the Nation”. The Berlin businessman received this great honor on Nov. 28, 2008 in company of journalists and politicians in festive surroundings. The contest “Mutmacher der Nation- Vanguard of the Nation” is the most successful initiative of medium sized businesses in Germany. The stories filled the press with enthusiasm during the contest 2007, 18 television stations and all leading daily papers reported at that time. It is an award for optimism, stamina and determination and is under the patronage of the Prime Minister of Lower Saxony, Christian Wulff. Andreas Contag is granted this award because in 1981, he started practically in the garage as a student with no financial means. After graduation, he already had a small business with a few employees. Today the company, still owned by him to 100%, is one of the market leaders of Europe. This continuous success is due to his optimism, straightforwardness, and his unique motivation of employees. Due to this, the 75 employees stand together like a family. Especially in times of crisis, a high business culture is of advantage for all jobs. 2007, the company moved into the new complex of the completely new and strongly enlarged production site in Berlin-Spandau. This complex was designed by Andreas Contag with a great love of detail especially concerning the needs of the employees. With the words, “The employee is the most valuable asset of a company – who am I without my strong team?” Andreas Contag inaugurated the new complex. And also the exercise room, the massage room, the parent-child room, the table tennis and the beach volleyball field. Everything included in the company premises with its park like character, inviting to stay awhile with its charm. Surely quite unusual for a production business. Andreas Contag says, „We are a family company in the most literal sense.“ Outings with all the family members of the employees are organized on a regular basis. This creates trust, which the employees again and again prove in the best of manner.